Innovant, Inc., a contract furniture industry leader, has finished the installation of its showroom in downtown San Francisco. This West Coast location offers visitors a full, dynamic Innovant experience. 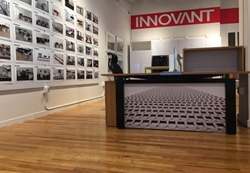 Innovant proudly announces the completion of its Bay Area showroom in the 49 Geary Art Building. Located in the heart of downtown San Francisco, the space has been furnished with all new open plan office products. Included in the furniture display is Innovant's award-winning FORm_office benching with both fixed and adjustable height work surfaces. Innovant has also installed NIGEL Desking in seat height, standing height and conference configurations. These new pieces can be seen alongside Innovant's market-leading FORm_AV huddle room furniture and its next generation private office product. About Innovant: Innovant is a renowned industry leader creating intelligent, adaptable furniture for the modern workplace. For over twenty-five years, Innovant's substantial contributions to office and trading environments have resulted from the sophisticated products and close collaboration Innovant supplies to clients and designers. With a flagship showroom located in New York, Innovant maintains a worldwide network of offices and showrooms spanning North America, Europe and Asia.